Yearning for the days gone by? The simpler times? Our vintage transportation will take you back in time. 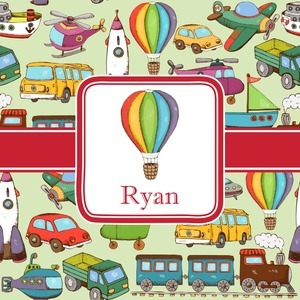 Using soft colors to highlight vintage hand drawn planes, trains, automobiles, and even a wonderful hot air balloon this design will put you at ease and take you back to your childhood. We have featured the various forms of transportation on a soft green background, with a classic red ribbon and square label. 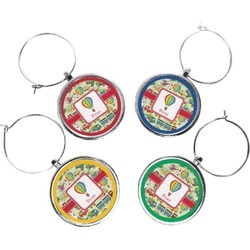 The label features a vintage hot air, along with a name for personalization.